Original 1986 vinyl LP soundtrack release on Enigma Records. 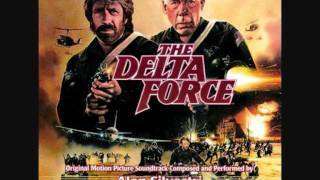 THE DELTA FORCE was a film starring Chuck Norris and Lee Marvin about an elite Special Forces squad. After getting his start doing scores for TV series (most notably CHiPs, for which he scored 95 episodes between 1978 and 1983), composer Alan Silvestri is best-known for his music for BACK TO THE FUTURE, WHO FRAMED ROGER RABBIT, THE ABYSS, THE POLAR EXPRESS, CAPTAIN AMERICA: THE FIRST AVENGER, THE AVENGERS and countless others. Elements of this film's electronic score got new life when used by ABC Sports as intro music for Indianapolis 500 broadcasts for more than a decade (1988-1998, and 2001), as well as other racing events.